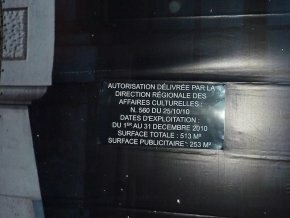 Four years ago, the Code du patrimoine was modified by a law (issued by Renaud Donnedieu de Vabres…) authorizing, under very specific conditions, billboards to be hung over the canvases covering historical monuments during repairs. We had not paid enough attention at the time to this modification of a law which normally forbids any advertising in the vicinity or directly on listed and registered buildings. True, the decree enacting it provided for certain limitations, notably that of the “compatability  of the advertising content, its volume and its graphics, with the historical and artistic character of the monument and its surroundings” as well as restrictions allowing only “50% of the total surface of the canvas support”. But what good are these restrictions when the officials in charge do not care to apply them ? 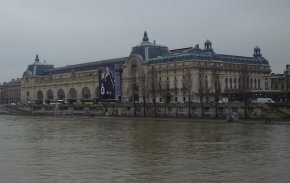 Nothing, as shown by the advertising at the Musee d’Orsay – and to make it worse, located on a Unesco World Heritage site – featuring a giant billboard much like the ones we denounced are now proliferating in Venice (see article). In October, passers-by could see an ad for Tudor watches and in November another for Air France. In December, the billboard featured an Yves Saint-Laurent perfume (ill. 1) which we find hardly qualifies as being “compatible” with the historical and artistic character of the monument. We point out that the advertising occupies 100% of the most visible surface of the canvas. This is a remarkable way of eluding the spirit of the law while still respecting its letter, because the two parts of the canvas which are perpendicular to the building represent in fact 50% of the surface, although they are quite clearly much less evident. Hypocrisy has even been pushed to the limit by imposing on this site, as stated in the decree , the reproduction of large pillars along the façade… (ill.2). 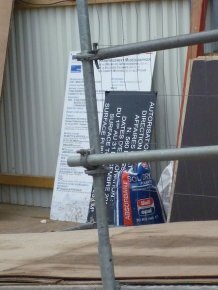 We also wonder about the imposing scaffoldings outside, when in fact the work concerns changes inside the museum. Although a hoist was needed, these are not, in the strict sense of the word, exterior repairs, as specified by law. The Musee d’Orsay is therefore respecting the law  but not in a very honourable way. We have no idea what this advertising, managed by the company Jean-Claude Decaux Artvertising [sic] brings in financially but, obviously, the public establishment has focused first on covering the cost of its new museum installation. We had understood that it was to be funded by paying exhibitions organized throughout the world with works which could no longer be displayed in the rooms being refurbished… In any case, the end does not justify the means and there is no reason for allowing the defacement, be it temporary, of a historical site, even more visible at night (ill. 3). This transient character (the billboard will stay until at least May) is in fact very relative. When the repairs are over, more will begin at another point along the Seine. And other institutions are highly interested in this initiative at Orsay, calling the museum to find out more details. No doubt billboards will crop up on scaffoldings elsewhere overlooking the Seine, and eventually, like in Venice, they will also be installed in places where there is no construction even. Paris, already infested with publicity, including the vicinity of historical monuments (we will soon write about this) will soon be nothing more than a giant advertising showcase. The term published in the Journal Officiel is “comptabilite”, a revealing typo which in French refers to accounting. We would nevertheless like to point out that although on 22 December 2010 the authorization information was posted “in a manner visible from the street”, as required by the decree (ill. 4), this was no longer the case on 30 December (ill. 5).